Ned Kelly is one of the earliest of Nolan’s Kelly paintings, created the same year that the artist first travelled to Kelly country in north-east Victoria. 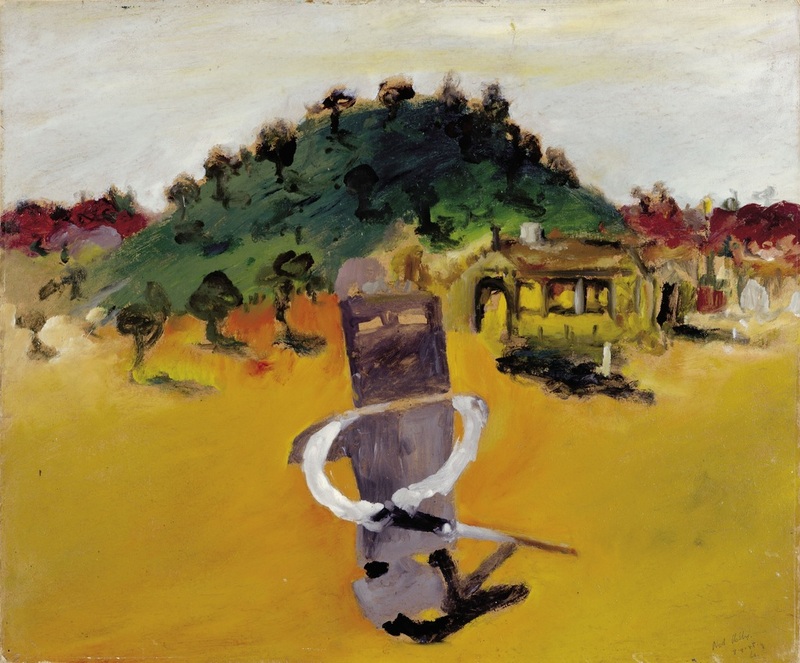 It depicts the solitary figure of Ned Kelly, in his home-made armour against a sparse landscape, its horizon interrupted by a densely-wooded hill with a small cabin (the Glenrowan Inn) in the foreground. Although Kelly boldly confronts the viewer, his stance is awkward, almost puppet-like, and it is a sharp contrast to the more confident and confrontational portraits of Kelly elsewhere in this series. The Ned Kelly paintings are Nolan’s most celebrated series, and they established his reputation as one of Australia’s most prominent artists. Created between 1945 and 1947, the larger series includes approximately 45 works, several of which share the same title. They focus on the story of Ned Kelly, Australia’s most renowned bushranger who was executed by hanging in Victoria in 1880. Whether Kelly was a hero or villain will continue to be debated but he has nonetheless become a significant figure in Australian folklore. Nolan was interested in the enduring power of the Kelly myth, and in his paintings Kelly is cast in various guises – as a loyal family member or an armed criminal – thus emphasising his human and individual traits. Nolan, like Kelly, was also the son of Irish immigrants, and it has been suggested that he empathised with Kelly’s anti-establishment stand, demonstrated by his rejection of formal art training and the bohemian lifestyle he led as he painted this series at Heide. Nolan admits that there is an autobiographical element to the Kelly paintings. He states: ‘Really the Kelly paintings are secretly about myself… From 1945 to 1947 there were emotional and complicated events in my own life. It’s an inner history of my own emotions…’. (Lynn & Semler, 1989). Lynn, Elwyn and Bruce Semler, Sidney Nolan’s Ned Kelly: Paintings and drawings from the collection of the Australian National Gallery, rev. ed., National Gallery of Australia, Canberra, 1989, p.8. The Foundation Collection comprises 24 paintings which are the first of several donations made by the artist, Sir Sidney Nolan to the Australian Government from the mid-1970s. Sidney Nolan (1917-1992) is one of Australia’s most widely acclaimed artists. He is best known for his iconic Kelly paintings which are based on the legendary story of Ned Kelly, Australia’s most renowned bushranger. The Foundation Collection comprises 15 paintings from the artist’s first Kelly series produced during the mid-1940s. It also encompasses paintings from the St Kilda and Burke and Wills series, and inspired by Nolan’s travels around Central Australia. Each of the paintings in this collection reflects the artist’s enduring interest in Australia’s landscape, history, and identity.